Set in a private nature reserve spread over 1,000 acres of Central America's last remaining lowland tropical rainforest, Lapa Rios Ecolodge overlooks the pristine point where the Golfo Dulce meets the wild Pacific Ocean. 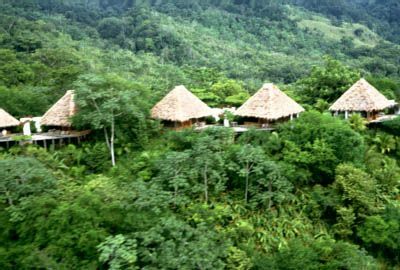 Built in 1992, the hotel features 14 thatched bungalows built along a line of three ridges connected by walking paths and steps, each furnished with locally made bamboo furniture, and surrounded by the rainforest. Guests feel part of the outdoors as constant tropical breezes pass through screened window walls. Each bungalow features a private deck and patio garden with an ocean view, complete with an outdoor shower. Interior shower baths are tiled and have two washbasins set in cristobal wood, matching the polished floors. Two queen-size beds are draped with mosquito netting. The main lodge, housing the restaurant and bar, soars 350 feet above the sea and is built of local, natural materials. Rainforest hikes, bird-watching, ocean kayaking, horseback riding, and surfing are some of the activities offered. Guests can take massages, participate in yoga classes, or relax at the pool while observing the many birds, monkeys and other animals that come by. Amenities include private bath, daily maid service, in-room safe, fax, laundry/dry cleaning service, currency exchange, complementary coffee, gift shop, 24-hour security, health spa/massage, and beach.